As owner and operator of Simple Elegance, Dane Bethea established Simple Elegance to be a one of a kind business by bringing a personal touch and special flavor to any occasion. 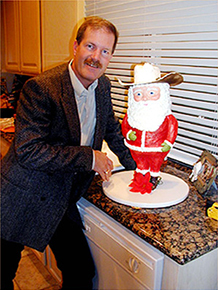 As the Nevada Representative for the International Cake Exploration Societe (ICES), Dane worked with other artists worldwide learning new and innovative cake decorating techniques and sugar art. Dane brings these innovative ideas to all Simple Elegance cake designs with an intense focus on detail and technique. "My greatest pleasure comes from the 'ohs' and 'ahs' as the cake is unveiled at an event and the smile on people's faces as they taste something very special."